Easy and fast transaction. Thank you. LLove doing business with you. Easy friendly transaction—would buy again! Very fast shipping, good seller AAA+++ Love the packaging !!! Excellent service and merchandise. Outstanding seller. Thank you. Fast shipping, item as described, nice holiday touch. Teaching many useful school oriented details through music, comedy and cartoons. The easiest way to learn “The Preamble” to the constitution of the USA, multiplying by 3’s, how a law is passed any much more. These are the exact segments that aired on tv in the 70’s. The picture quality is the same and so is the quality of information. The CD with the same title is a good addition to learn along with the dvd, as the dvd has the visual which helps for memory, and many many songs not included on the cd, but the music on the cd is much more modern and appealing to the children in this millennium. Ive owned two sets of each- dvd and cd, for teaching my first set of children born in the “90”’s and my second set born in “00”,s. I doubt the average child today would choose watching this over a mindless cartoon movie looking just for entertainment, but for a child who likes to learn or who doesn’t learn easily, this dvd is immensely valuable. My “00”’s children watch these when told, with no complaints, and sometimes miss the real message because they are finding the humor more entertaining. I started my children out around 5 watching, as many of the concepts are useful in elementary school, like: conjunction junction, electricity, the interjection song and my hero zero, but it has ideals needed even into high school. All four of my children learned to skip count from “3, is the magic number”, we all learned the “preamble” from the cd version, I still sing: lolly get your adverb song, unpack my adjectives and Mr Morton when trying to help with English homework. Mr. Morton is one of our favorite songs on the cd from the 90’s. SCHOOLHOUSE ROCK! STILL ROCKS! BUY THIS FOR KIDS! 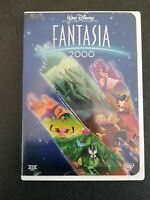 Why to buy THIS DVD?! If you don't know of Schoolhouse Rock, You missed out! But it not too late! You and your children will laugh out loud and sing along together with these classic educational musical cartoons and this DVD has them all! Everyone will see and hear super songs like "Cunjunction Junction", "Lolly, Lolly, Lolly, Get Your Adverbs Here! ", & "Interplanet Janet" and many more! Its hard to find anything that blends as much education, music, entertainment, and just plain fun! A little history of Schoolhouse Rock, at least from my memory; We go back to the late 70's, early 80's and the big thing for children was Saturday morning cartoons! I remember spending too many hours watching those great programs when the world seemed so much less serious and we didn't have so many worries, at least as a child. In between those cartoons, someone at Disney, I believe, came up with these short little educational cartoons, featuring some of the best musical animations mixed with basic educational themes that are sure to get into your childrens memories! Will they make an impact? Well 25+ years later and here I am typing in this review, telling You about them, where will your child be in 25 years? What do you remember about your Saturday mornings from a quarter of a century ago? I bought 2, 1 for my sister and her 2 year old son. Thanks for reading this, I wouldn't type a review about junk! BUY NOW! This is one rockin' DVD! Starting in the early 70s, ABC began broadcasting a series of animated musical shorts called "Multiplication Rock", in which songs and visuals were combined to teach children mathematics in a whole new and exciting way. This concept eventually expanded to include "America Rock", "Science Rock", "Money Rock" and "Grammar Rock". Together, they were collectively known as "Schoolhouse Rock!" This spectacular 2-disc DVD release contains all 46 of these timeless cartoon videos together. In addition, this set also features bonus materials such as Top Ten Jukebox, Top 20 Countdown, "Earn Your Diploma" Trivia Game, Scooter Computer And Mr. Chips segments, The Long Lost Song "The Weather Show", an all-new song "I'm Gonna Send Your Vote To College" created especially for this DVD, and more. This home video release is one of the finest DVDs of its kind, perfect for Baby Boomers who grew up watching these classic shorts and for younger viewers who will get an education from this material. While many animated programs from this era have come and gone and ended up largely forgotten, the "Schoolhouse Rock!" series is a timeless treasure trove of songs and informative educational fun that has endured for many years. One viewing of this DVD, and you, too, will be singing slong with "Conjunction Juntion, What's Your Function?" Recommended for teaching your children! Putting facts for memorization to music is a fun way for children to absorb information. My children absolutely love to watch Schoolhouse Rock! They walk around the house singing all the old favorites of past generations...they don't even realize they are learning. Songs pop out of their minds at all times during our school day. There is a song for every main topic of education. It is a good thing when a 5 and 6 year old can sing the preamble to the constitution, count by 3's and 5's and know what conjunctions, interjections and adverbs are! 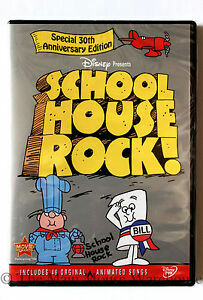 I love the DVD format which includes the total collection of Schoolhouse Rock! songs. The only thing I do not care for is the contemporary section...but we just avoid it. Also, there are a few content issues to deal with, but they are good for thought-provoking discussion. Like so many other baby boomers, I grew up watching and listening to these catchy helpful tunes on Saturday morning cartoons. Conjunction Junction, what's your function? In the 70's and 80's, the catchy Schoolhouse Rock tunes taught millions of children the fundamentals of math, grammar, science, history and money. Relive the pop culture sensation with the SCHOOLHOUSE ROCK SPECIAL 30th ANNIVERSARY EDITION DVD, which includes every song from the landmark series in a collectible 2-disc DVD. Among the over 50 tunes are such classics as "Conjunction Junction," "Three is a Magic Number," "I'm Just A Bill" and "Electricity, Electricity." This sensational DVD features an all-new song about the Electoral College, "I'm Gonna Send Your Vote To College" written by the show's original creators. Do any of you remember the long lost song The Weather Show? Well, it's included too! Also Never-Before-Released Scooter Computer and Mr. Chips 3 song set behind the scenes of the all-new song, with an introduction by the one and only Micheal Eisner.